Lavoro a coppie. Gli studenti leggono il testo proposto e inseriscono le parole mancanti, scegliendole dalla lista che trovano di seguito. Il significato dei termini sottolineati è fornito alla fine del testo, per le altre parole gli studenti possono usare il dizionario. Al termine si corregge collettivamente con l’aiuto dell’insegnante. Tempo previsto: 30 minuti. The outbreak of World War I in August 1914 ended Picasso’s partnership with Braque, who was called up to serve in the army. Although Picasso, as a Spanish citizen, did not have to become a combatant, he was affected by the changed atmosphere in Paris, and then devastated by the death of his companion, Eva, who succumbed to tuberculosis. His spirits revived when the writer Jean Cocteau recruited him to design the decor and costumes of Parade, a daring modernist production by Serge Diaghilev’s celebrated Russian ballet. Working on the project in Rome, Picasso found himself exhilarated by the city and its classic tradition, and by the physical beauty of the dancers. He fell in love with one of them, Olga Koklova, who became his wife in July 1918. 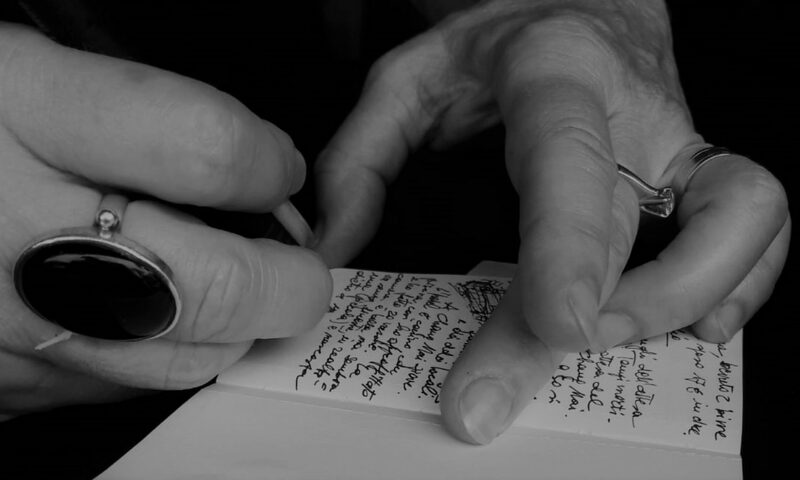 Lavoro di gruppo. L’insegnante divide la classe in piccoli gruppi di tre/quattro persone. All’interno di ogni gruppo si discute (in inglese) osservando i due lavori di Picasso e rispondendo alle domande proposte. Alla fine si corregge collettivamente con l’aiuto dell’insegnante. Le risposte qui formulate sono puramente indicative. La correzione deve essere il punto di partenza per uno scambio di idee e interventi da parte degli studenti. Tempo previsto: 60 minuti. How is the subject positioned? What do you see of her? Is she dressed or naked? What makes you come to this conclusion? Answer: The subject is a woman who is playing a mandolin: we can see her almost frontally, the face is a little reclined on the right. All the parts of the body are synthesized in geometrical elements, assembled on the canvas, giving an intellectual idea of the subject and not a realistic representation. She is naked, in fact her breast is very evident. In the background, especially on the left, you can see other geometric shapes, looking better it is possible to identify some canvas with the frame, one over the other, so the painting was made in the studio of the painter. Which colours did Picasso use in the Girl with a Mandolin (Fanny Tellier)? In which way did he spread the colours on the canvas? Answer: Picasso used a few tonalities of beige and grey; he used a very sophisticated technique, spreading the colour with little strokes, in every geometrical area the colour passes from the light to the dark. 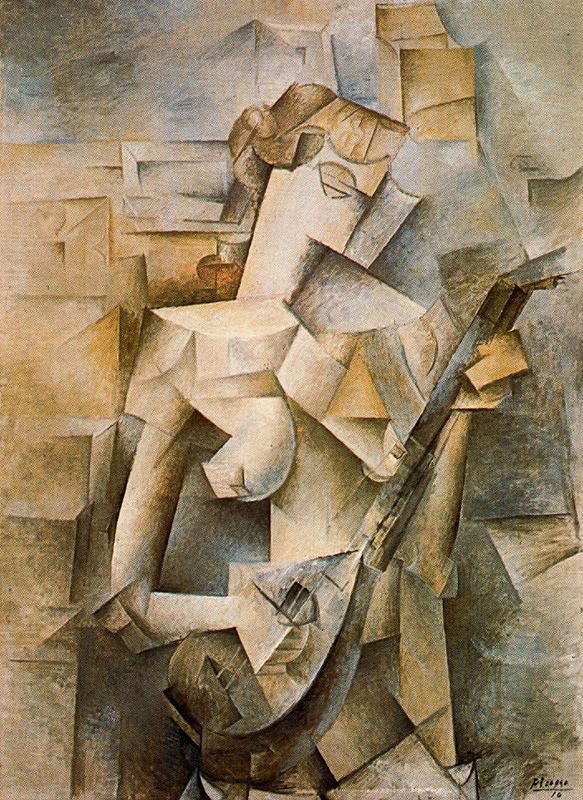 What was the purpose of Picasso painting the Girl with a Mandolin (Fanny Tellier) in this way? Answer: The purpose was studying the reality from another point of view, more intellectual, eliminating everything that was superfluous and de-constructing the subjects into their components. It was an artistic experiment. How is the subject positioned? What is she doing? Is she elegant? What do the fan she is keeping in her hand and the decoration of the armchair, remind you of? Why did Picasso paint her with black hair and eyes when she had auburn hair and green eyes? Answer: Olga is seated on a chair, her right arm is supported by the backrest of the chair. In her left hand she keeps a fan half opened. Her black dress is very elegant, her hair are tied back, so her look is very sophisticated. 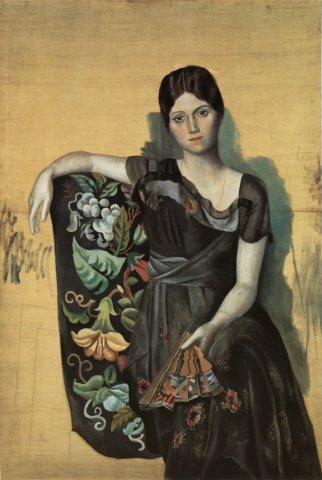 The decoration of the chair and of the fan remind one of Spain, but also the choice to paint her with black hair and eyes, instead of auburn hair and green eyes, it seems as if Picasso wanted to change Olga into a Spanish woman. The background is not finished, most of that is the original canvas, Picasso concentrated on painting only the subject. What makes the Portrait of Olga in an Armchair so mimetic? Answer: Picasso tones down the colours, giving an idea of light and shadow: in this way the subject emerges from the background with her volume. What was the purpose of Picasso painting the Portrait of Olga in an Armchair in this way? Answer: Picasso in this painting wanted to exalt the beauty of his fiancée; in this period he was influenced by classical art and the Renaissance that he admired in Rome. The strong references to Spain were to make his mother happy, who wanted a Spanish girl as a daughter-in-law. Do you think that Picasso was able to represent the female gracefulness in both of the paintings? Explain your ideas. Why and when did the artistic experimentation of the Cubism finish? In 1917 Picasso studied the decor and costumes for a ballet; what was the name of the ballet and what was the city where Picasso had to go?